The Church of Yoga photo credit: Katie Sikora. Group fitness is an ever growing industry—over 18 million people in the U.S. had memberships to fitness studios last year. From HIIT to boxing to yoga to dancing, people look to group fitness for camaraderie, motivation, instruction, variety, and fun. But with many boutique fitness studios charging $20 - $30 a class and over $100 in monthly memberships, it can get expensive. Fortunately, there are several fitness groups and studios in New Orleans (including Move Ya Brass) that take affordability into consideration. The FitLot is a fitness park located off the Lafitte Greenway near N Galvez St. The circuit based workout is open for anyone looking to get in some strength training using body weight apparatuses and resistance bands. If you'd like instruction, free all-ages classes are held Wednesdays at 7:45 AM until March 13. More sessions will be added, including for those 55 years and older, starting March 13. Check their Facebook page for updates. This free grassroots fitness movement has groups throughout the world encouraging athletes of all ages and abilities to stay moving. There are four November Project opportunities in New Orleans for early risers: Mondays at 6:00 AM at rotating locations, Wednesdays at 5:15 & 6:00 AM at Champions Square, and Fridays at 6:00 AM at Shelter 1, Lakeshore Dr. No registration or money required. Just show up and be ready for anything! 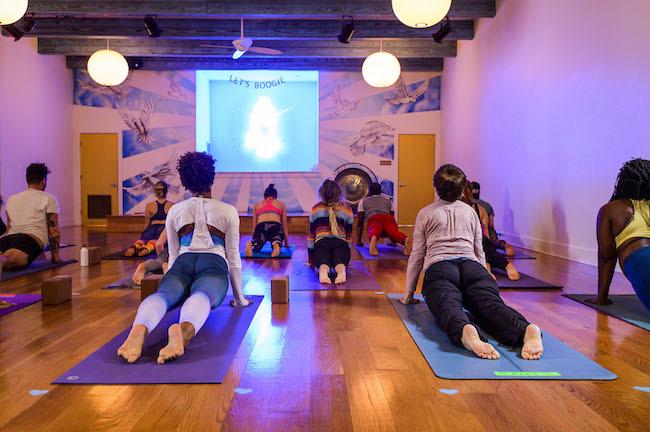 This "generosity based yoga center” in the 7th Ward will never turn anyone away for lack of funds. Some of their classes are listed as free like Kids Yoga, Beginners Yoga, and Morning Mantras, while others are pay-what-you-can like Yoga & Recovery. But even for classes like Soul Sweat that has a suggested donation of $15 - $20, there is no pressure to pay at all. It is The Church of Yoga’s’ hope that those who cannot afford a class will not feel pressured to pay, while those who do have the money will pay a fair price. The NORDC has multiple recreation centers around New Orleans offering free fitness programming. The only exception would be classes at the Gernon Brown Center, which charges $5. You also might occasionally run into a donation based class, but, by and large, you can stop by a city recreation center, sign up, and join classes like Body Sculpting, Cardio Blast, Fitness Fusion, Line Dancing, Pilates, Vinyasa Yoga, and Hip Hop Cardio (taught by Move Ya Brass' very own Shanda Domango) for free. They even offer archery at no charge. Six of the centers also provide free use (for those 18 years and older) of their cardio machines and workout equipment. Check the schedule and locations at the NORDC. Swan River Yoga has two locations in New Orleans—on Canal St. in Mid City and Magazine St. in Uptown. Regular drop-in classes are $18, but they do offer students a 20% discount and occasional $8 community classes. However, their location in Arabi is one hundred percent donation based. You just pay what you can. From beginner to intermediate to Iyengar to Restorative yoga, "The purpose of this community center is to offer, with the deepest and purest intention, the practice of yoga and other uplifting activities for everyone regardless of their ability to pay." If you've ever wanted to know just what the heck Barre is (combination of isometric holds, small muscle movements, and cardio), Barre3's $5 Community Class might be for you. The discounted session allows the curious to drop-in while the studio’s new instructors practice their skills. It's offered once a month, so you might have to stalk their schedule to see when that is, but it's worth it if you don't want to pay the normal $23 drop-in rate. It’s also wise to check for new member specials like their current offer of 3 classes for $30 at their Uptown, Downtown, and Old Metairie locations. This fitness studio in Metairie offers athletic based vinyasa flow, recovery yoga, and cardio circuit classes. Their regular drop-in prices are $18, but on Fridays, you can join their $5 Healthy Happy Hour. In this Fitness Yoga Sweat class, you'll be taken through moves that borrow from yoga, Pilates, gymnastics and strength training. New Orleans Museum of Art and East Jefferson Wellness Center have collaborated for a weekly Tai Chi/Chi Kung class on Monday nights at 6:00 PM among the museum's art galleries. Then, on Saturdays, they host an 8:00 AM Saturday morning yoga class in the museum’s permanent gallery or, weather permitting, in the Besthoff Sculpture Garden. $5 per class or free for NOMA and East Jefferson Wellness Center members. Since the museum will be closed during these hours, go to the back of the building to the staff/volunteer entrance. You’ll get buzzed in. This downtown studio's high-intensity training sessions will kick ya brass without costing a fortune or wasting your time. For $15 you can drop-in to one of their VersaClimber (indoor climbing machine), Lagree Fitness Megaformer (core stability, functional, movement and total body conditioning) or Boxing (technique, mechanics and intensity) classes for a transformative 25-minute workout. You'll be in and out for under 20 bucks. Students can also now purchase an unlimited monthly membership for $65. The Bywater's Dancing Grounds studio brings "high-quality, inclusive and accessible dance education programs to New Orleans residents of all ages and backgrounds." Their regular drop-in classes run $12—or $10 for students, artists, teachers, and military. Which is reasonable, but if you want to affordably try out all the dance styles they have to offer, first-time students can buy a one-time $39 unlimited monthly membership. That will allow you to experience a different dance class every day of the month: Hip Hop, Afro-Caribbean, Ballet, Tap, Latin Styles, African Dance & Drum, Contemporary Jazz, and more. Wild Lotus has several ways to test out your yoga abilities in a welcoming, positive and community-oriented space. Their regular drop-in price is $20, but they also offer sliding scale Community Classes, as well as $10 Yoga for Lunch and $10 Yoga for Musicians & Service Industry classes. However, their best deal might be their $33 for 30 days of unlimited classes for NOLA residents new to the studio. They have two locations to explore: The Healing Center on St. Claude and on their yoga studio on Perrier in Uptown. What other affordable fitness options do you recommend? Tell us below! After moving away from her hometown, just outside of Detroit, Lori has done her best to stay out of her former constantly-working-to-make-ends-meet rut. Having lived in Los Angeles, Chicago and Denver, Lori began her writing career covering soap operas. While she will always keep track of the latest returns from the dead on “General Hospital,” she now focuses her writing on fun ways to stay happy, fit and out of the house. Recent adventures have led to her love of indoor cycling, getting pampered at the spa and her new favorite city New Orleans. A Midwestern girl at heart, Lori is back in Chicago, where she continues her quest to top the thrill she felt her first time on the trapeze.